"The final test of a painting, theirs, mine, any other, is: does the painter's emotion come across?" American Abstract Expressionist Franz Kline is best known for large black and white paintings bearing abstract motifs set down with strident confidence. He started out as a realist with a fluent style that he perfected during an academic training that encouraged him to admire Old Masters such as Rembrandt. But after settling in New York and meeting Willem de Kooning, he began to evolve his signature abstract approach. By the end of his life he had achieved immense international recognition, and his unusual approach to gestural abstraction was beginning to influence the ideas of many Minimalists. 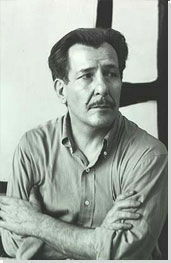 Franz Kline is most famous for his black and white abstractions, which have been likened variously to New York's cityscape, the landscape of his childhood home in rural Pennsylvania, and Japanese calligraphy. The poet and curator Frank O'Hara saw Kline as the quintessential 'action painter', and Kline's black and white paintings certainly helped establish gestural abstraction as an important tendency within Abstract Expressionism. Yet Kline saw his method less as a means to express himself than as a way to create a physical engagement with the viewer. The powerful forms of his motifs, and their impression of velocity, were intended to translate into an experience of structure and presence which the viewer could almost palpably feel. Along with De Kooning and Pollock, Kline was one of the examplary artists heralded in Harold Rosenberg's definition of Action Painting. Kline's reluctance to attribute hidden meanings to his pictures was important in recommending his work to a later generation of Minimalist sculptors such as Donald Judd and Richard Serra. 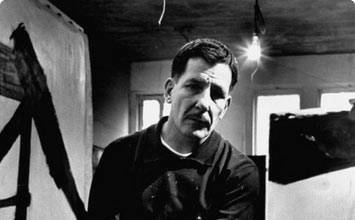 Franz Kline was born and raised in Wilkes-Barre, Pennsylvania, a small coal-mining community that offered few opportunities for artistic development. His childhood was marred by a complicated relationship with his parents. His father, a saloon keeper, committed suicide in 1917, when Kline was only seven years old. His mother later remarried and sent her son to an institution for fatherless boys, which the artist referred to as "the orphanage." Unlike his friends Pollock and de Kooning, Kline never experimented with figurative elements in his mature work. Painting No.7 is a fine example of his black and white pictures. The rigid geometry of broad black lines defines the composition, perhaps manifesting his reconsideration of the iconic paintings of squares by Kazimir Malevich. Critics' comments on the pictures included in Kline's breakthrough show of 1950 set the pattern for later reviews with their variety of analogies. Chief was the name of a locomotive Kline remembered from his childhood, and it's possible to read the image as a sensory reminiscence of its power, sound and steaming engine. Some also believed that the artist's obsession with black was connected to his childhood spent in a coal-mining community dominated by heavy industry. Many have since noted, however, that the forms in these early abstractions seem to have evolved from Kline's drawings of his wife Elizabeth. He made numerous sketches of her sitting in a rocking chair in the years when she began to succumb to mental illness; the circular forms in Chief bear comparison with the blank circles representing her face in the drawings. Four Square is another example of Kline's experimentation with angular compositions. Although apparently structured in its compositional rigidness, Four Square is a fine example of his gestural approach to painting. The viewer is led to ponder the canvas, seeing as either a close-up of a linguistic symbol or, perhaps, a set of open windows. In this work Kline is also attempting to construct a three-dimensional abstract composition, whereas most of the Abstract Expressionists preferred the two- dimensional treatment of the pictorial surface. Kline achieves the visual effect of depth through energetic juxtapositions of vertical and horizontal lines and their diagonal overlapping. Meryon has a strong architectonic sense in its composition. The inspiration was possibly an engraving of a clock tower by the 19th-century French artist Charles Meryon. Again, Kline represents not the object itself, but his vision of it. Seemingly spontaneous in its arrangement, this composition was conceived through a number of preliminary studies, shedding a new light on the nature of his gestural technique. Black Reflection is an example of Kline's early attempts at introducing color back into his works. The treatment of color in this composition could be related to the contemporary paintings of Willem de Kooning and Hans Hofmann. The focal point of this picture is the black shape that Kline previously employed in the Untitled composition of 1954. This fact further attests to the careful consideration the Action Painting artists devoted to the pictorial forms in their compositions. Probst I refers to Jack Probst, a fellow artist who lived near Kline in Greenwich Village. At first glance, this composition is typical of his black and white work. However, more colors are present on this canvas. There are dabs of yellow and pale salmon that illuminate the massiveness of black twisted shapes, creating warm luminous effects. Probst I is an example of Kline's late work where he returned to employing a wider palette.